It has two main types namely Urticaria (common Hives), and Angioedema which occurs internally. Rare cases of Angioedema are life-threatening as the swelling can block air passages towards the lungs. It commonly occurs to every individual. Its causes are hard to pinpoint due to the symptoms’ uncertainty of being an external or internal reason. Ordinary ones flare up suddenly and can change sizes, and it can scurry from other parts of the skin in a matter of hours. The center of treatment focuses on alleviating the symptoms until it disappears on its own. Usually, taking an oral medication of antihistamine is enough to lessen the symptoms most of the cases. Acute Urticaria or Angioedema: It is the ordinary type of Hives we encounter usually caused by an allergic reaction from food, medicine, latex or i The occurrence lasts for less than six weeks. Chronic Urticaria or Angioedema: It lasts for more than six weeks to years, and its underlying cause is difficult to diagnose. It can arise from the same causes of Acute-Urticaria with the addition of autoimmunity, viral infections, and malignancy. In most cases, doctors would recommend a laboratory allergy testing. If the result is insignificant, medical history, oral intake of food/medicine, and habits can help in finding the cause. 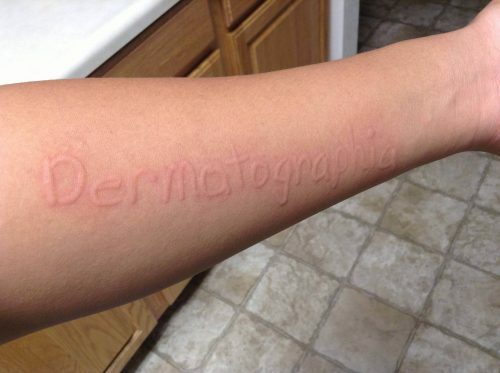 Dermatographism: It is an intense swelling reaction when scratching or stroking the skin. It can appear with other types of Urticaria in some cases. Histamine is commonly the primary cause of this skin issue. This chemical is released by mast cells when the skin is stroked, leading to dermatographism. Physical Urticaria: It is a direct cause of physical stimulation of the skin causing it to swell. The reasons may vary from cold, heat, sun exposure, vibration, pressure, sweating, and exercise and may appear on the area within an hour after stimulation. Hereditary angioedema: It is a skin disorder in which there are recurrent episodes of severe swelling externally in the limbs and face, and internally in the digestive tract and airways. The swelling may trigger without a known reason and may cause abdominal pain, nausea, and vomiting if it occurs in the gastrointestinal tract. Its symptoms start in childhood and worsen during puberty. Hives are harmless, and it would only bring discomfort in most cases. However, it is advisable to observe yourself or the person infected to prevent rare situations that may turn fatal. Contact a medical professional if you feel out of breath, nauseous, abdominal cramping, and excessive swelling for proper treatment to be administered.